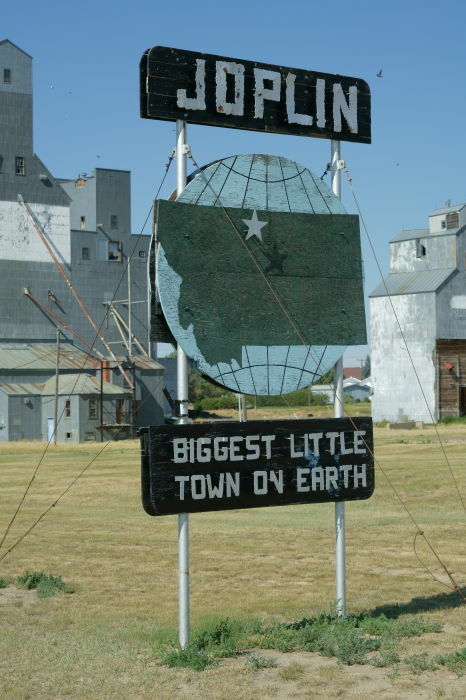 Joplin, Montana is the “Biggest Little Town on Earth.” The sign says so, as you arrive. But the sign is misleading – there’s nothing big about Joplin. I’m not even sure it’s technically a town. But, any place that’s willing to self-promote itself so boldly deserves at least a passing glance. 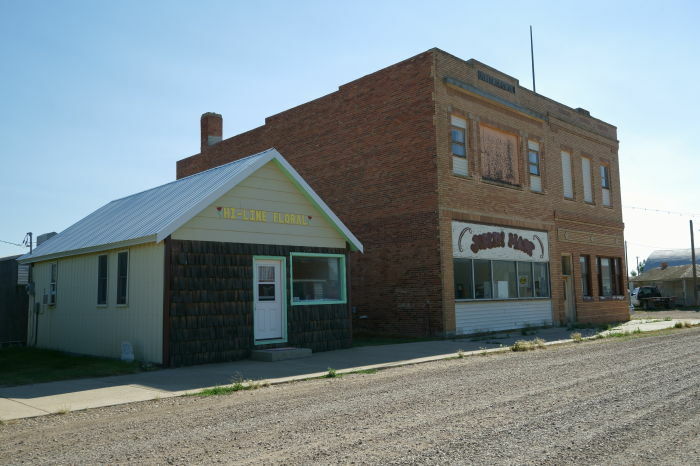 Joplin, Montana is located on US 2, the Hi-Line, in north-central Montana. It’s about 50 miles west of Havre, Montana. … that great sign captured most of my attention. I’ve read that the sign (either this one or earlier versions) and the slogan date back to the 1910’s, when it stood near the train depot, to greet passengers as they arrived. The most noticeable building in town (aside from the grain elevators by the railroad tracks) is the old brick storefront that must have been the center of downtown Joplin at one point. The Joplin Drug Company opened here in 1917. There may have also been a bank in the building, circa 1916. Montanahistoriclandscape.com offers some details about Joplin’s slow decline over the years. It says that Joplin had a community band that performed at the bandshell in the town’s park up until it disbanded in 1937. In the mid-1930’s, the WPA brought some new life into the town, paving sidewalks and constructing the school on the north end of town. The school was closed in 2005. I noticed the school as I drove around town (it would be hard not to), and I think I noticed the park as well. You might catch a glimpse of both on the Drivelapse videos below. But without much more to hold my attention, I was quickly back on US 2 again, continuing the journey east. I thought that Joplin’s most interesting feature was its “Biggest Little Town” sign. If you’re in a hurry, you can drive by Joplin and you won’t miss much, but if you want to explore every town along the Hi-Line, take at least a few minutes to drive through town.